Will Alexander is light years ahead of us all. This gorgeous volume from Essay Press invites us on to his wavelength. Read it with your third eye open. Literary Nonfiction. African American Studies. Edited and with an Introduction by Taylor Brady. Afterword by Andrew Joron. One of the most prolific and original figures in the field of contemporary literature, Will Alexander is known worldwide for his arresting explorations of European and Caribbean surrealism, postcolonial history, twentieth-century philosophy, and contemporary scientific theory. Here, Alexander undertakes nothing less than a redefinition of the essay form itself, opening an "artery of twilight" wherein aesthetic, political, historical, social, cultural, scientific, and theoretical discourses often become indistinguishable elements of a holistic investigation into the composition or, re-composition of the physical and metaphysical worlds. 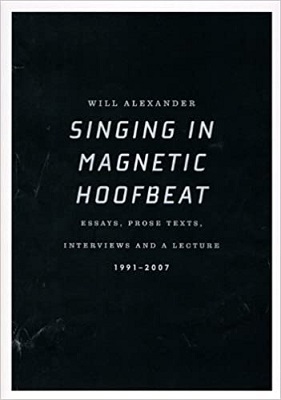 SINGING IN MAGNETIC HOOFBEAT is an indispensible record of Alexander's thought, and confirms his reputation as one of the foremost exponents of Afro-futurist modernism. "In SINGING IN MAGNETIC HOOFBEAT...Alexander praises his influences; analyzes the politics and aesthetics of the long 20th century; reflects on the repressed, but undeniable importance of African cosmological views to the European Renaissance; and articulates the expansive possibilities of what we might call non-exclusively an African diasporic surrealism. For a trail guide to the wonders of Alexandrian poetics, read these essays. For fresh evidence that surrealism is alive, not as a 'movement, ' but as a freedom-oriented, imaginatively unbounded mode of being in the world, read these esssays." Evie Shockley.